tackling climate change. The UNFCCC-COP22, viewed as the COP of implementation, will be hosted by an African country, Morocco, and will present an opportunity for the continent’s citizens to enhance the advocacy for accelerated climate action, and particularly the implementation of the Paris Agreement. In the countdown to the Marrakech Climate Change Conference to be held on 7-18 November 2016, African stakeholders, including governments, Civil Society and development partners, are actively engaging in various preparatory processes aimed at building momentum. This is this moment to build the profile of Africa, first as a champion of climate action, and secondly as the region recognized as the most vulnerable to climate change impacts. This will be the time to tell the world that though climate change, which we have played insignificant role to cause, has slowed our journey to economic progress, we want to collaboratively turn this monumental challenge into opportunity. We want to use the Morocco narrative of hope than despair to tell the global community that, yes, this is the continent which has borne the brunt of climate crisis, but our resilience built over years has made us survive scorching sun, erratically torrential rainfall, floods and droughts. These are stories being told by our communities, but because they cannot reach bigger audience, remain within themselves. There is need to share these stories. Telling the stories as they are! And this is the spirit of the 3rd edition of the African Climate Change and Environmental Reporting (ACCER) Awards. Two milestones have already been achieved. We already have received hundreds of entries of the third edition, and now we are on the next stage. A very delicate stage (the selection process) where all the entries are handed over to the group of judges which scrutinized them and select the Finalists. Judges will keep the list of the selected finalists under lock and key, until the day announcements will be made in public. Once the finalists are unveiled, they will be placed in extensive training, under the Auspices of The ACCER Awards Finalists Academy (TAAFA), where the recommendations of the Judges will form the curriculum of the 3-Month non-resident, online interaction between journalists and trainers. The ACCER Awards Gala Night, to fete the Winners, will be held at the sidelines of the Sixth Climate Change and Development Conference for Africa (CCDA-VI). And the announcement of the finalists will take place at yet another continental forum, at the sidelines of the 27th African Union Summit in July in Kigali, Rwanda, whose theme will be“African Year of Human Rights with Particular Focus on the Rights of Women”. PACJA appreciates the successful growth of the ACCERAwards which lies in the collective dedication, responsibility and ownership cultivated over time. 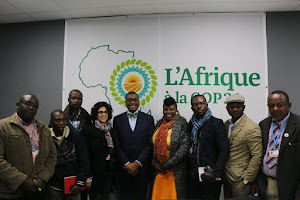 It is our desire to reflect the shared prosperity and well-being, for unity and integration, for a practice of free citizens and expanded horizons, where the full potential of men and women across Africa in the field of Climate change and Environmental reporting are realized, and with freedom as they tell and shape our own African narrative of climate change.